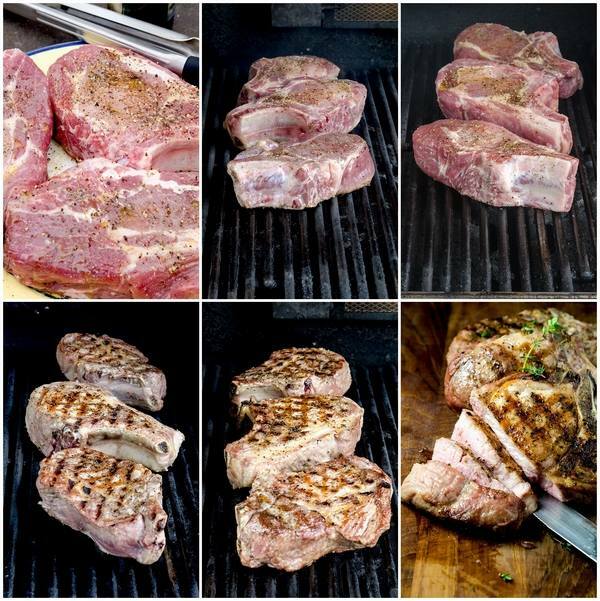 How to grill pork chops to perfection? We shall reveal all the secrets that you need to know – from the choice of meat to practical tips and useful advice! Pork is the most universal and popular meat and grilling is one of the most popular cooking methods. 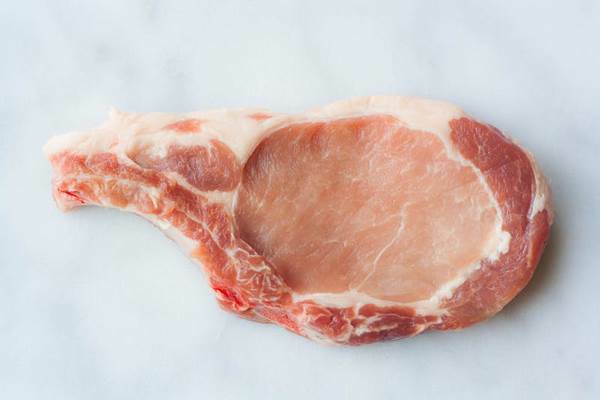 The main secret of pork chops is, of course, good meat. It takes some knowledge, understanding and common sense not to ruin the meat and cook a really juicy pork chop. Our ancestors cooked food exclusively on fire, and this way of cooking is still considered the most useful and dietary. When meat is grilled it preserves all the vitamins, gets the aroma of the fire and always remains tender and juicy, while excess fat is melted, and the delicious crispy crust makes the dish exceptionally tasty. It is hard to find people who are indifferent to grilled meat. 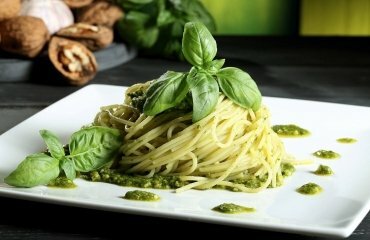 However, despite all the advantages of such dishes, they can be ruined easily. The actual type of cut is very important. Loin, blade or rib chops, boneless or bone-in, the market offers a variety of types, thickness, etc. Not every pork chop is suitable for grilling. 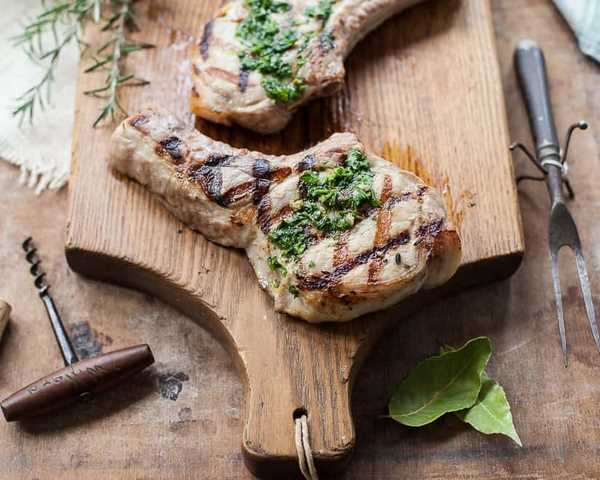 Choosing the right cut is the first step and the key to having a perfect grilled pork chop. Let’s have a quick look at the different types of cuts. 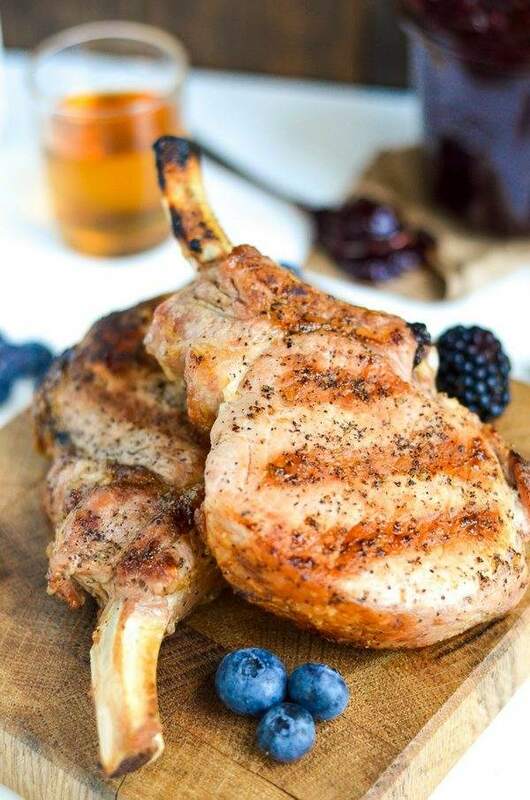 Blade chops, also called shoulder chops, blade-end pork loin chops or pork shoulder steaks come from the shoulder and their meat is darker with lots of fat and connective tissues, as well as and some blade bone. Blade chops may be tough and chewy due to the large amount of fat which is not fully rendered while grilling. These cuts should be properly tenderized first, especially when you want to cook them over high heat. Sirloin chops, also known as Sirloin steaks, are cuts from the hip area, below the loin section. 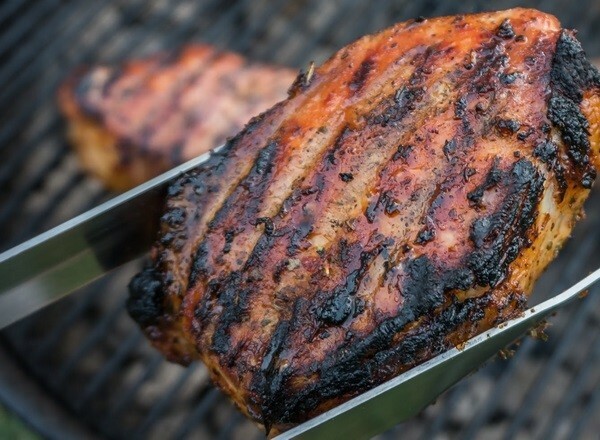 This cut is the hardest to grill as it contains meat from different muscle groups. 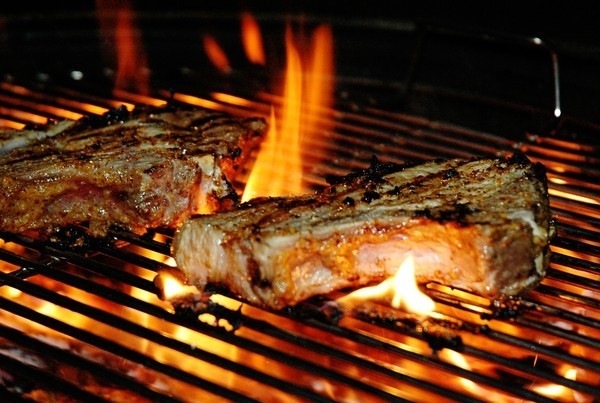 If you plan to grill sirloin chops, it is better to marinate the meat for several hours or overnight before grilling. 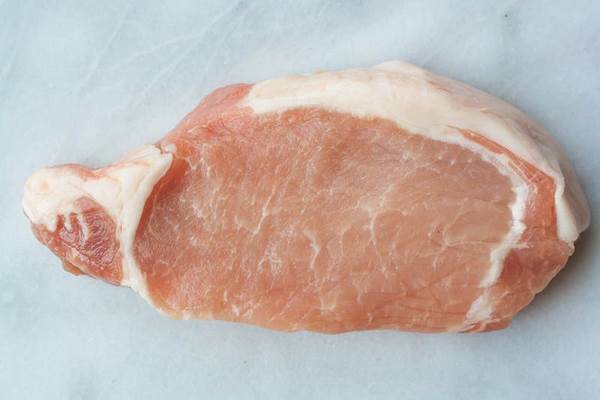 Boneless chops (pork loin fillets) – one of the cuts which are ideal for grilling. 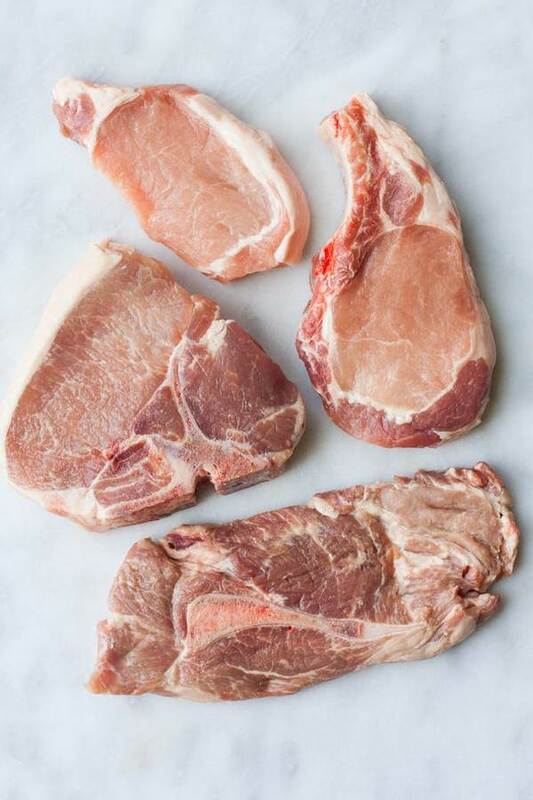 The meat has very little fat and connective tissue, no bones and is easily overcooked which means that brining the chops is beneficial. 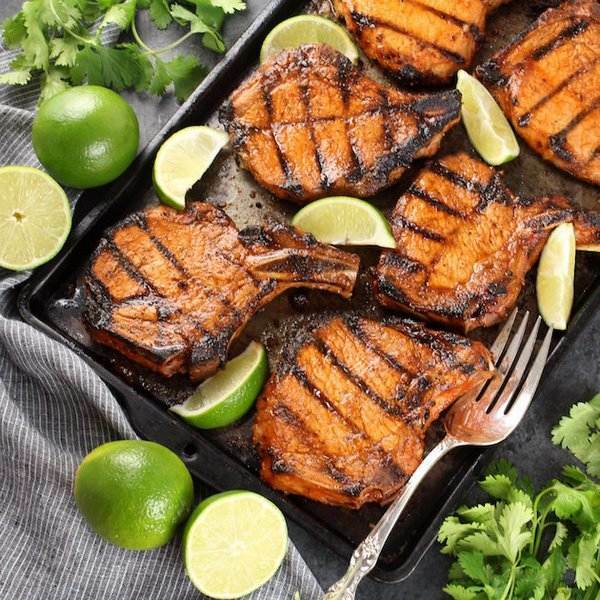 An important step in the preparation of meat for grilling is brining – this is a process that is not particularly long, but it allows to improve the taste of the pork chops significantly and make them soft and tender. Depending on the ingredients of the brine or marinade, the meat can be incredibly moist and full of flavor. 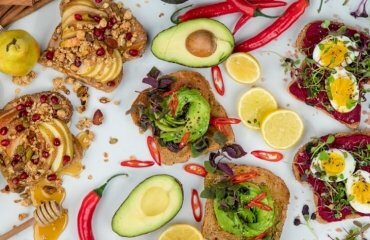 Typically, marinades include red and white dry wine, beer, cognac, pomegranate and orange juice, olive or peanut oil, wine or balsamic vinegar, mustard and soy sauce. Those who like it hot may add a few drops of Tabasco sauce. 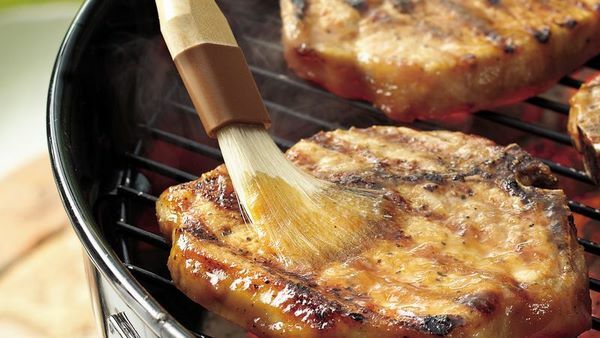 Lemon juice, tomato paste, ketchup, honey and mustard are also often used to marinade pork chops. For more taste you can add onions, garlic, spices and herbs. The delicate aroma of thyme, peppermint, bay leaves, rosemary, cayenne pepper, basil, tarragon, sage and curry best accentuates the taste of meat cooked on grill. 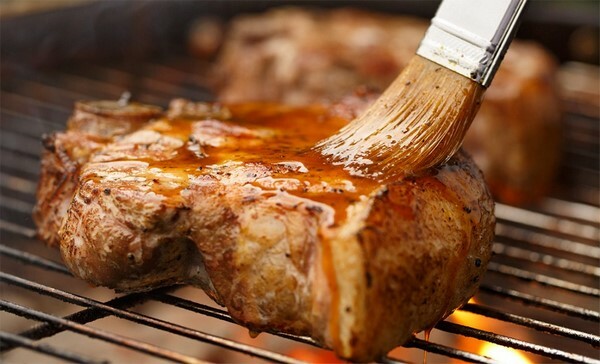 Sweet marinades with sugar or honey are ideal for fatty meat and give its taste an exceptional flavor. Brining allows you to keep the meat moist and helps you avoid overcooking. In addition, this is a great way to add flavor into the meat! Brines can be either wet or dry. Wet brines are based on salt (sometimes sugar) while dry brine can be as simple as sprinkling salt over the meat to coating it with a variety of dry herbs and spices. Brine the meat for at least one hour (overnight or 24 hours) and it is ready to be cooked! 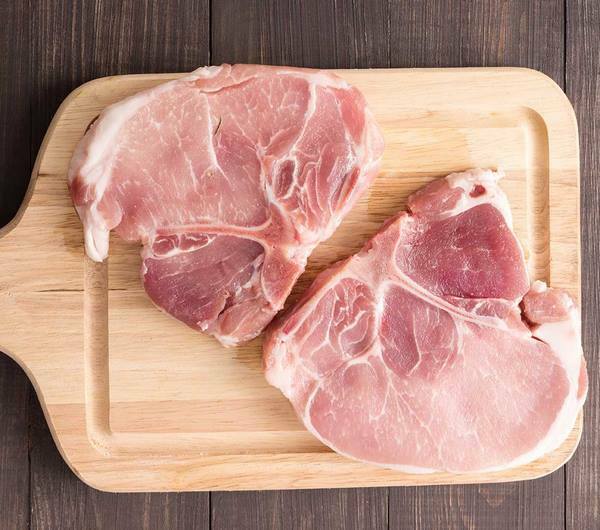 Always keep pork chops in brine in the refrigerator. Do not leave them at room temperature. 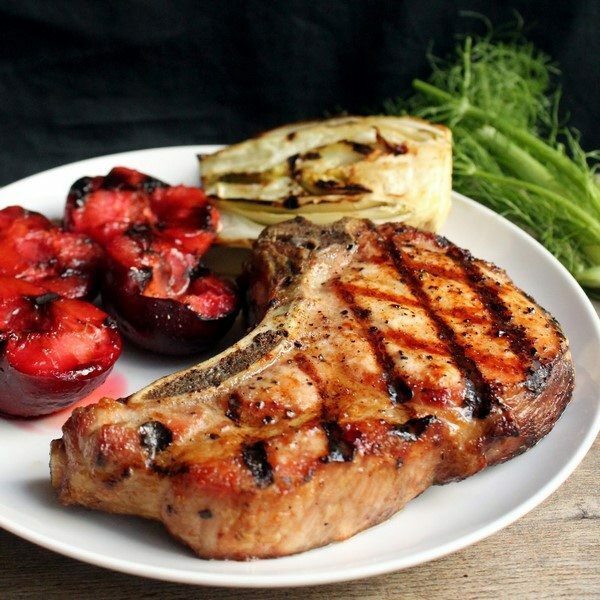 How to grill pork chops to perfection? 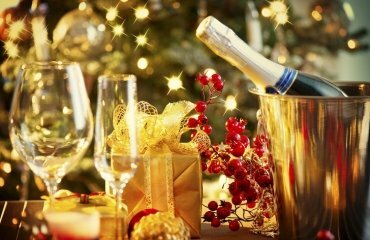 Here are some practical tips which you can use as guidelines. Try not to use frozen meat for the grill, because when thawing out all the juices flow out and the dish turns out to be too dry. 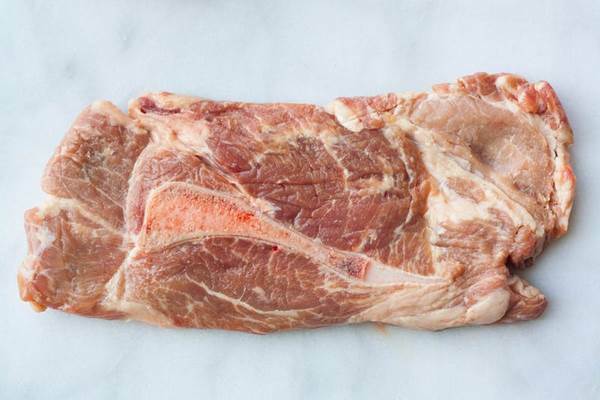 If a piece of meat lay all night on the shelf of the refrigerator, an hour before cooking it should be laid out on the table and allowed to warm up at room temperature. Do not forget to remove all unnecessary – ligaments, tendons, films, cartilage and coarse connective tissue, as inedible parts of meat will make it tough and prevent you from enjoying a delicious dish. Do not use vessels or containers made of aluminum as it spoils the taste of the meat. Choose thicker cuts. Lean chops are easier to overcook while double-cuts or chops that are at least 1 1/2 inches thick give you more time and control. Bone-in cuts benefit from having the bone as it adds flavor, helps the meat remain tender and also helps retain moisture. Overcooking is one of the most common mistakes resulting in dry meat. Professional chefs advice to choose a bone-in cuts as the bone and the fat around it provide some protection against overcooking. 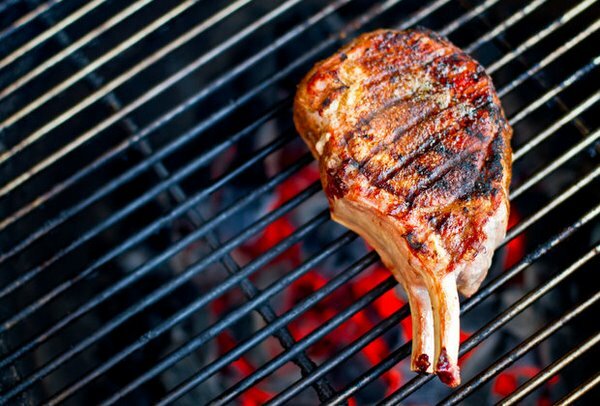 Bring the chops to room temperature is a good idea since the meat near the bone remains cold for a longer time which means that you may have under cooked areas near the bone or overcooked areas on the outside of the chop if you wait for the meat near the bone to be cooked. 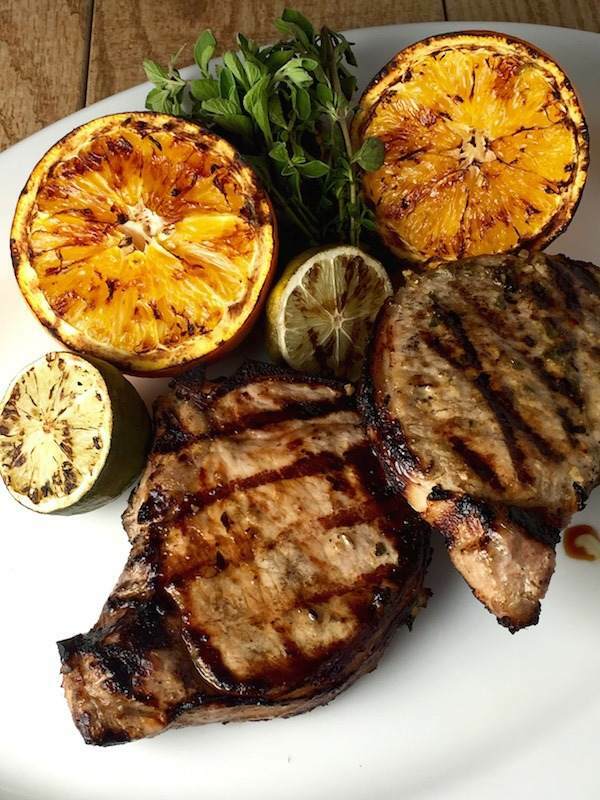 Before placing the chops on the grill, take them out of the wet marinade or brine and pat them dry. Sprinkle some olive oil so that the surface is slightly greasy and you are ready to grill! Make sure that your grill is clean whether it is charcoal or gas. Always preheat the grill on the highest setting until the grate is hot. Keep a thermometer at hand. Spray the grate with grease so that the meat does not stick. 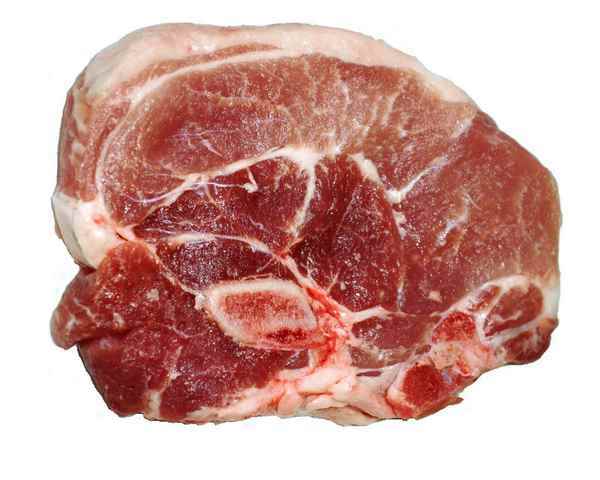 Cooking times for pork chops will vary depending on the thickness of the meat. Lean and boneless cuts will be cooked for minutes while thick chops require more time but there is a risk to burn the outside. Gas grills allow you to adjust the grill temperature, so start with hot and lower to medium. 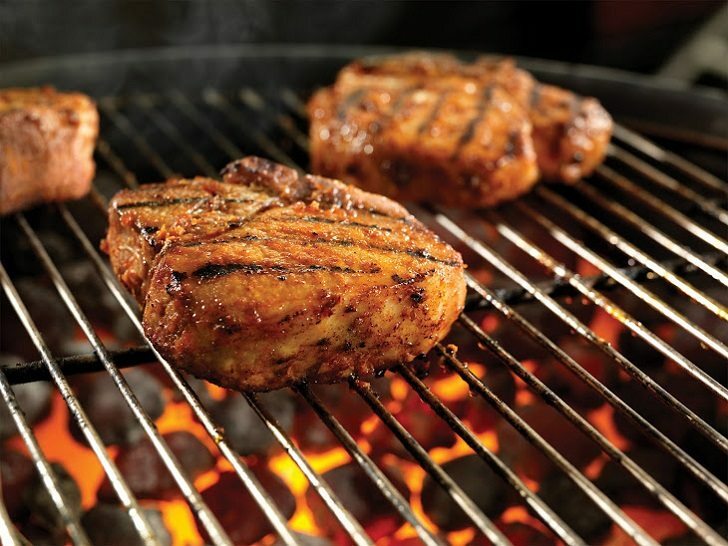 Those who use charcoal grills can control the temperature by moving the chops to a cooler side of the grill. 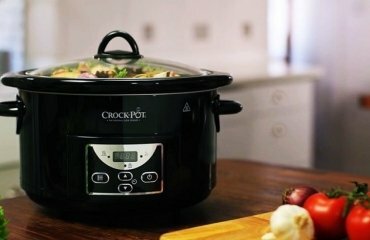 The safest way to tell when the meat is ready is to check its internal temperature, so an instant read thermometer is one of the kitchen gadgets worth the investment. When the internal temperature reaches 145°F (63 degrees C), remove it from the grill. Meat, decorated with grill markings, looks very impressive. To achieve the pattern, press it to the hot grate. Lay the chops on at a 45 degree angle to the grates and then turn the chops 45 degrees to the grates in the opposite direction. 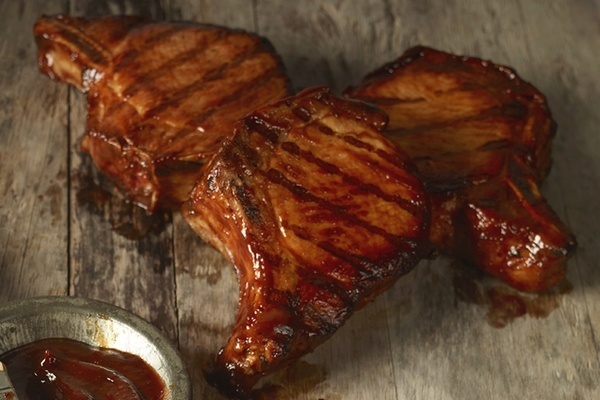 Grill your pork chops until crisp and then flip each piece on the other side. Do not touch the meat during grilling otherwise you will ruin the integrity of the crust, the juice will flow out and in the end, the meat will be dry. You can glaze the meat before removing the chops from the grill. To prevent the glaze from burning, apply it about 10 minutes before they are cooked. Let the pork chops rest for about 8-10 minutes. Cover them with foil as this time is needed for the juices to settle back into the meat so that the pork chops are extraordinarily juicy and deliciously tender. 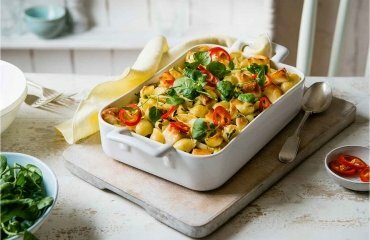 Serve with greens, fresh vegetables, potatoes, cheese, mushrooms or barbecue sauces.